A big problem has somehow landed in your lap. Everyone’s looking to you to make the final decision, the ripples of which will extend far beyond your little team. But the boss went on holiday with a clear “do not disturb” notice. What do you do? How Urgent Is the Decision? Is the boss’s unavailability really a problem? Or are you worrying about nothing? How applicable is Admiral Grace Murray Hopper’s famous saying: “It’s easier to ask forgiveness than it is to get permission”? Consider the scale of the problem. If it’s a relatively small decision, you’re probably OK to go ahead with what you think is right. But if it’s a big one, start by assessing the urgency of the situation. As my old boss, Rich Baek, once recommended, “Don’t make any difficult decisions until action is required. Who knows, circumstances might change and you won’t even need to do what you dreaded.” So, if it can wait, prepare yourself to make the decision, but don’t cross that line just yet. Don’t forget to take your company’s culture into consideration, too. Your organization may have a culture that aims to empower its staff and prizes self-starters. If this is the case, you’ll likely feel more positive about making high-level decisions on your own. Getting their advice will help you to weigh up the pros and cons of the situation and earn support for your final decision. It could also “soften the blow” of a decision “gone bad,” particularly if your judgment is called into question later. You may have a boss who trusts your decisions and is happy for you to take on decision-making responsibilities in his absence. Alternatively, you may have a boss who finds it hard to give up control, and who refuses to delegate decisions while she’s away. If this is the case, don’t be afraid to ask her for more information. Arrange a meeting with her, and set up a clear agenda to discuss the problems that you are encountering. Say: “Thank you for your valuable time. My aim is to keep our clients happy and our operation running efficiently. To do this, sometimes decisions need to be made when you are unavailable. Please help me to better understand my boundaries and options for these urgent decisions.” Make sure that your tone is constructive and your message is delivered tactfully, without a whiff of complaint. Add that you would appreciate feedback from her about the decisions that you make when she’s absent. Michael Kerr has useful advice if the boss is often away. He suggests asking your boss, “What can I do to support you and the team in your absence?” This will show that you are a real team player, and that he can have trust and confidence in your ability. Above all, don’t let indecision hold you back. Stepping up to the plate and showing that you can think through decisions clearly and objectively could bolster your reputation. It will also demonstrate to your boss that you’re strategically focused and capable of taking on extra responsibilities. There are also times when your boss is away and there are no major decisions to make. Assuming that you are used to working long hours, why not ease your foot off the gas a little? Brian Moylan offers a handy guide to working when the boss is away. First and foremost, he advises that you avoid calling in sick. If you do this, you’ll be seen as unreliable and self-centered. But, you can afford to wind things down just a little bit. Take a leisurely lunch (and not at your desk – instead, go out with your team!). And, just this once, leave on time! 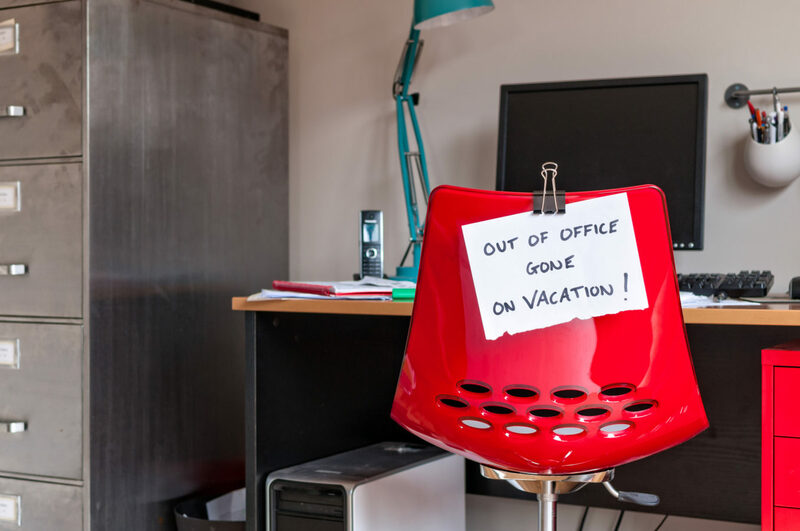 Moylan continues, “Do one thing really well and you are far less likely to have your productivity questioned while the boss [is] away.” Take some time to really bond with your co-workers. This will help you to boost team morale, motivation and collaboration. Have you ever had to make a difficult decision while your boss was away? Did you “step up to the plate,” or “cave” under the pressure? Was your boss happy with your decision or was he horrified? Share your story in the Comments section, below.